You are currently browsing the category archive for the ‘The Holy Spirit’ category. What Are The Great Sins Against The Holy Spirit According to Dietrich Bonhoeffer? 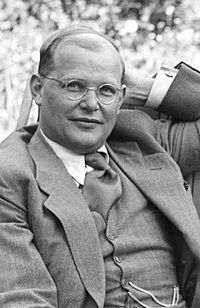 It was his brother love of his fellow-men which also caused Bonhoeffer to believe that that it was not enough to follow Christ by preaching, teaching and writing. No, he was in deadly earnest when he called for Christian action and self-sacrifice. This explains why Bonhoeffer always acted spontaneously, “in hiding,” far from all publicity, and why he considered self-righteousness and complacency great sins against the Holy Spirit, and regarded ambition and vanity as the start of the road to hell. ~ Memoir by G. Leibholz in Dietrich Bonhoeffer, The Cost of Discipleship, 1961 edition, 23.